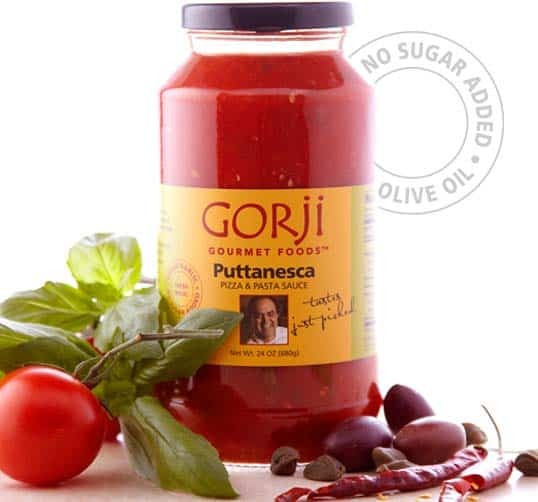 Gorji Gourmet Puttanesca Sauce for Easy, Elegant Meals. Puttanesca Sauce can be used in any recipe requiring a zesty tomato sauce…even a plain meatloaf will be the star of the dinner table when accompanied by spoonfuls of this puttanesca sauce. Chef Gorji adds fresh basil, capers, chopped olives, and some cayenne pepper to his “taste just picked” Pomodoro sauce to create a zingy version of a classic. It is a no fuss base for quick and easy pizzas. Delicious in pasta and with seafoods such as mussels, clams and squid for a flavorful cioppino. Make chicken cacciatore or serve as a dip with cold shrimp for a fresh and tangy take on the classic shrimp cocktail.” Scovie Spotlights Gorji Gourmet Puttanesca and Shrimp. In Italian lore, the intense fragrance of this sauce is a siren’s call to enjoy it whenever possible. Enjoy restaurant quality meals and save time. Your family and guests will love that it will taste like you spent hours in the kitchen preparing fresh sauce.